PDF digital book, after purchasing you will download this item to view it. Best viewed with Acrobat Reader. by John Hogue, © 2007 Hogueprophecy Publishing, 17,500 words, 55 pages at 350 words per full page for a standard size book. After purchasing you will need to click on the words “Return to Hogue Prophecy Publishing” to complete your transaction and to get your download link. A prophetic reassessment after the death of John Paul II of the famous Prophecy of Papal Succession unto Doomsday. 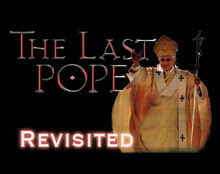 Does the crowning of Pope Benedict XVI mark the reign of the second-to-last-pope before the Apocalypse? The pages of the Holy Gospel laid atop the pontiff’s cedar coffin in St. Peter’s Square, lifted and turned in soft winds as if some invisible hand was closing the book on one of the greatest popes who ever lived. His name was De labore solis (From the Sun’s Eclipse). This Latin motto is not a name most people attribute to John Paul II. It is the label given to him by a saintly Irish pilgrim who upon seeing the holy city of Rome purportedly fell into an ecstatic trance and called out John Paul’s prophetic name 865 years before he was laid to rest in the year 2005! The pilgrim was St. Malachy, the Prelate of Ireland, who in the year 1140 allegedly recorded 111 cryptic Latin mottoes followed by an apocalyptic coda forecasting the succession of 112 pontiffs unto Judgment Day. John Paul II was the only one out of 112 popes St. Malachy foresaw with a name describing a solar eclipse. John Paul II would be the only pope on that list spanning the succession of nearly nine centuries who was born on a solar eclipse and entombed on a solar eclipse! This is one example among many astonishing prophetic bulls eyes from a set of prophecies that do what seems impossible: become more accurate the farther they witness the line of pontiffs ranging down a distant future. For instance, John Paul II’s predecessor is called “From the Half Moon.” Pope John Paul I was born on the day of a half moon! The names taken at birth or at rebirth as pope, the medallions commemorating unique episodes in papal reigns, and intimate details of family or papal heraldry crowd these prophecies with successes almost too true to be believed. Dom Arnold Wion, it is said, rediscovered the papal prophecies of St. Malachy and sandwiched them within his tome of over 1,800 pages, entitled Lignum vitae, which was published in Venice in 1595. Ever since, these Latin phrases have existed under some suspicion of being a forgery. Are they composed in 1140 by the real St. Malachy or by someone in the 1590s under the pseudonym of a medieval saint? The near perfect success of all mottoes forecasting the names, acts and heraldry of popes before their discovery should garner suspicion. Nothing is more accurate than a prophecy foretold “after” the event. Yet truly, if it were a fraud, the 35 mottoes remaining after publication would predict next to nothing accurately. In fact, the remaining 35 mottoes for popes to come after the 1595 publication retain a remarkably high ratio of accuracy. Whoever wrote them–St. Malachy or someone else–was a prophet. One of the most accurate in history. The pope of “our” times will hear the noise of battle near and far and rumors of war. During his watch on St. Peter’s throne, nations will make war upon nations. There will be famines, earthquakes in many places. With Benedict we enter times of early signs of the opening travails of a new age. To what extent is the new pope aware of St. Malachy’s prophecy? Had he dismissed or secretly accepted the role of next-to-last pope before the End Times, when it was believed that after great global catastrophes and wars, Jesus would return and judge the world? Was he aware of it, or indeed ready to perpetuate the expected destiny of end time prophecy? This and other important questions are answered in this long-awaited update of my best selling book from 1998: The Last Pope: The Decline and Fall of the Church of Rome. The eBook The Last Pope Revisited reassesses St. Malachy’s prophecies after the death of John Paul II in 2005 hastened the succession of Pope Benedict. We will now see whether St. Malachy’s prophecy really marked Benedict as a pontiff standing at the beginning of the global tribulations and transformations to come in the reign of his successor, the last pope, named Petrus Romanus (Peter of Rome). When we think of “Apocalypse” most of us imagine fire and brimstone, destruction, final Judgment Day, leading to an eternity of damnation for most–salvation for the chosen few. This eBook will entertain an interpretation both revolutionary and faith provoking. If and when the apocalypse–the revelation of God’s divine enlightenment–happens, it is reasonable to expect that it will be something beyond what we have known, hoped for, or feared, because all who have lived before and live today, proclaiming they know what it is, stand on this side of the closed door to its future, revelatory light. How do we know whether the ball and chain of doomsday dogma that orthodox religion has tied to the ankle of our flying being is anything more but a string tied to a harmless balloon? This eBook will revisit more than papal prophecies coming to the end of their line. If we stand now so close to the opening of Revelation’s door, is it not time to do as Jesus once beckoned, to become again “as little children” when facing our prophecies of the end–fresh, open, ready for a new born understanding of what Revelation means? Are the Prophecies a Forgery from 1595? Is Benedict XVI the Last Pope, or, is there one Pope more? Either I did something wrong or my system screwed up, but I bought and saw a copy of the “Last Pope Revisited”. I didn’t get prompted to save it and I didn’t. When I try to get it back, it’s gone. What do I do now? The Prophecy of the Popes.. was first published by Benedictine monk Arnold Wion in 1595. Wion attributed the prophecies to Saint Malachy, a 12th‑century Archbishop of Armagh, Ireland. Given the very accurate description of popes up to 1590 and lack of accuracy after that year, historians generally conclude that the alleged prophecies are a fabrication written shortly before they were published. THE ROMAN CATHOLIC CHURCH ALSO DISMISSES THEM AS FORGERY. So, what is the bottom line between St Malachy’s prophesy and the new elected Pope Francis? It seems the prophesy is broken with this Pope. Not actually, JW. As my new article will soon show. Moreover, the choice of Francis shines a new light into the prophecy of the man from ancient France (Francis) inquatrain 49, Century 5. All popes are Peter the Roman. Birth name, Pope name and Peter, as they wear the shoes of St. Peter. One looks at St. John Bosco’s Dreams, he gives clues to the line of the last Popes. They appear to be one; moreover, in reality they are Peter. Mankind’s universe is created by mankind. Choice is always ours. Choose well and create its tomorrow. Your article on the last Pope is inaccurate and misleading. Malachy actually predicted only 111 Popes, the last being ‘The Glory of the Olive’, Ratzinger. The 112th name was actually added to the list by Olivetan monks in the year 1559, a full 419 years after the original Malachy predictions of 1140. We are now on the last Pope and are running out of time. It is important that all people know the truth so that they may be saved. God Bless. Was that the prophecies are not written by the Irish Medieval saint, but by someone who remains anonymous from the 1590s who used St. Malachy as his cover. Moreover, the prophecies written after the “discovery” of St. Malachy’s prophecies are over 80 percent accurate. Whoever this author from the 1590s was, he is one of the most accurate forecasters in history. Penny, and anyone else who has a prefabricated judgement or a sincere interest in this subject, why not READ ‘The Last Pope Revisited” or “The Last Pope: The Decline and Fall of the Church of Rome” before commenting on it here. Thank you. I do not believe that Malachy’s prophecy was written in the 1590s, as to me it does not make sense that it was. The records state that the prophesy manuscript was in the Roman archive until 1590, but nobody knows how long it was there, or even if it was there at all. So what? For it to have been written in the 1590s, means it was never there. That just doesn’t make sense to me. I used to believe Nostradamus really wrote it, and used Malachy as the author because he (Nostradamus) was Catholic, and did not want to prophecise doom for the Catholic Church. I no longer believe this, because Nostradamus lived from 1503-1566, while the Malachy prophesies begin with Celestine II in 1143. So if Nostradamus wrote it, why would he “prophesize” about 350 years of Popes who were already dead? Nostradamus’ own prophesies show he was serious about his prophecy. Nostradamus would have began his prophesies (I believe) with the 1550s Popes, which is when he began his “seeing,” first with his almanac in 1550, and then his own Centuries. On the other hand, Malachy lived from 1094-1148, his visions were in 1139, and the Malachy prophesy begins with Celestine II in 1143. That makes sense. It seems to me that Malachy did write it, but that the records of its origin are simply bad. So what? Also, just because the 112th Pope was not added to Malachy’s prophesies until around 1820 does not mean the 112th Pope was not originally part of it, and omitted when it was first published in 1595. Again, it makes sense that during the Dark Ages, a prophecy about the downfall of the Catholic church would probably be viewed as heresy, right? (2) Cardinal Tarcisio Pietro Evasio Bertone-the Vatican Secretary of State, a skilled politician, and he was born in Romano Canavese! !, whereas Turkson was born in Ghana. I say it is Bertone. It just fits. No Pope has ever taken the name Peter, out of respect for St. Peter, but a Pope whose real name was Peter would. Comment on this, Mr. Hogue? I just wonder if the last pope will be chinese or black from Afrika. I have no comment on the fallen church of rome, this will only depend on the billion catholics in this planet. Rumors of war, it doesn´t look good for 2012-2013. what if Nostradamus meant 2025 for world war three that will give us more time to relax, especially with this world crisis. Relaxing is a euphemism for postponing. Denial is nourished, therefore. If you enter what I’ve called “The Roaring Twenties” (the next decade) and only start thinking about making real changes, you will be too late. As for the next pope, he will not be an African. Most likely we will return to an Italian pontiff. Preparation may be a better term to use, since I cannot fathom anyone preventing Gods will from taking place. What we can and cannot fathom often says more about what we have been forced to borrow from others as an imprint masquerading as personal insight. Meditation exposes this illusion and can bring back a non-predisposed-to-judge mind. One becomes “IN”-nocent and intelligence beyond the mind and its judgmental limits can be awakened. Fr. M.J. O’Brien showed that the list of popes prior to 1550 depended on Pavinius’ history of popes. Therefore the list of mottoes was not composed by St Malachy, but, most likely, by Fr. Wion himself. That fact in itself does not invalidate the prophecy which must, as Fr. O’Brien stated, stand or fall on its own merits. In 1624 Fr. Thomas Messingham edited Fr. Wion’s list by combining the last two paragraphs. That editing has remained with us ever since and is the cause of our present day confusion about Pope Francis being “Petrus Romanus.” If we remove Messingham’s alterations and go by Fr. Wion’s original list we see that it actually has a total of 113 papal mottoes. The first 111 of these consist of just one line. Number 112 has two lines, and number 113, eight lines. Another historical mistake was the mistranslation of the Latin word “sedebit” as “there will sit.” But that is an English usage of an imaginary noun that does not exist in Latin. Petrus Romanus is still to come and can be only one person.